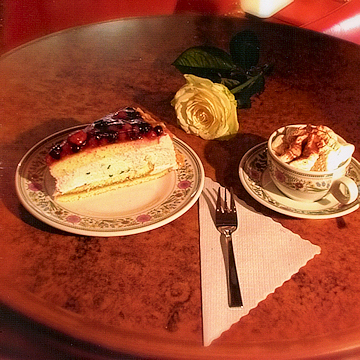 Carpe Diem - Chill out and enjoy the day with Café Mozart! Here is the kind of place you can pop into at anytime of the day. From the menu you can start your day with a simple croissant, a full german, american or italian breakfast, or just stop by for a quick cup of tea or freshly brewed coffee. We are famous for our bakers' home-made specialities, cake and famous tarts such as Schwarzwälder Kirsch (Black Forest Cherry tart), Sacher, Schweizer Nußtorte and Frankfurter Krokant Kranz. Otherwise, for those with hearty appetites, the menu has a wealth of choices and offers main courses such as steaks, seafood fillets, delicious fresh Mozart salads, vegetarian dishes like spaghetti and a variety of daily specials. You can choose from an array of antipasti, pasta and desserts. Settle back in comfy leather chairs, enjoy a friendly service, the stylish decor and the sophisticated spacious interiors. Café Mozart is the ideal spot to relax with friends without the need to dress up. During the summertime, a summergarden is open for outdoor dining in a lively ambience. The cafe and restaurant Café Mozart has more than 100 seats.